This image of Comet 67P/Churyumov-Gerasimenko shows the huge diversity of Surface Structures that can be found on the Comet's Nucleus. 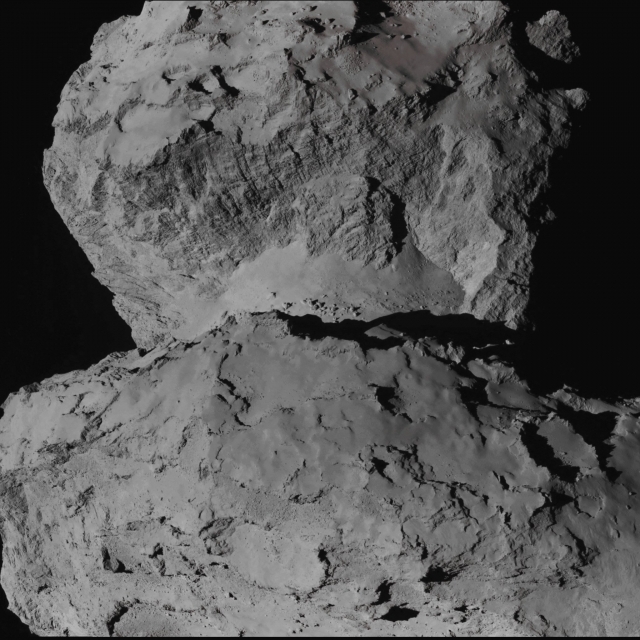 The picture was taken by the ESA - Rosetta Spacecraft's Navigation Camera on August 7, 2014. At the time, the Spacecraft was about 65 miles (such as approx. 104,6 Km) away from the roughly 2,5 miles (such as about 4,02 Km) wide Rocky Nucleus of 67P/Churyumov-Gerasimenko. In the picture, the Comet's "Head" (look at the top half of the frame) exhibits Parallel Linear Features that resemble (looks like) Cliffs, while its "neck" displays scattered Boulders on a relatively smooth and, perhaps, slumping, Surface. In comparison, the Comet's Body (lower half of the frame) seems to exhibit a Multi-Variable Terrain, with Peaks and Valleys, both showing smooth and rough Topographic Features. Just out of curiosity, we, as IPF, believe that this, in fact, "Extremely Complex (as far as its shape and physical characteristics are concerned) Celestial Body", might be the final result of the "fusion" (in a manner of speaking) of two very different Minor Celestial Bodies which, some time in a very remote past, either collided (and, in that case, it should have been what we call "Slow Collision"), or, while passing very close to each-other, were gravitationally (and, of course, mutually) attracted, until, some they, they started "touching" each other and, thorugh hundreds of millions (or, maybe, a few billions) of years, became "one thing", such as this fascinating and totally unusually-looking Cometary Body. Launched in March 2004, Rosetta was reactivated in January 2014 after a record 957 days in hibernation. Composed of an Orbiter and a Lander, Rosetta's objectives upon arrival at Comet 67P/Churyumov-Gerasimenko in August are to study this Celestial Object up close in unprecedented detail, prepare for Landing a Probe ("Philae) on the Comet's Nucleus in November 2014, and then track its changes as it sweeps past the Sun. In fact, Comets are just like "Time Capsules" because they contain Primitive Materials left over from the epoch when the Sun and its Planets formed. Rosetta's Lander will obtain the first images taken from a Comet's Surface and will provide the first analysis of a Comet's (basic) composition by drilling into the Surface. Rosetta also will be the first Spacecraft to witness at close proximity how a Comet changes as it is subjected to the increasing intensity of the Sun's Radiation. Observations will help scientists learn more about the origin and evolution of our Solar System and the role Comets may have played in seeding Earth with Water, and - perhaps - even some kind of Lifeforms. This frame (which is an Original ESA - Rosetta Spacecraft's b/w and NON Map-Projected image published on the NASA - Planetary Photojournal with the ID n. PIA 18596) has been additionally processed, contrast enhanced, magnified to aid the visibility of the details, Gamma corrected and then colorized - according to an educated guess (or, if you wish, an informed speculation) carried out by Dr Paolo C. Fienga - in Absolute Natural Colors (such as the colors that a human eye would actually perceive if someone were onboard the ESA - Rosetta Spacecraft and then looked outside, towards the Comet 67P/Churyumov-Gerasimenko) by using an original technique created - and, in time, dramatically improved - by the Lunar Explorer Italia Team. Different colors, as well as different shades of the same color, mean, among other things, the existence of different Elements (Minerals) present on the Surface of the Comet 67P/Churyumov-Gerasimenko, each having a different Albedo (---> Reflectivity) and Chemical Composition.